Okinawans express themselves about U.S. military bases in the prefecture. want the American bases completely out. "Like a souvenir, you [Prime Minister Abe] would like to bring signs of progress on the Futenma Air Base relocation to the president of the United States. Could this be the reason for your visit to Okinawa? If so, you are not welcomed here. Okinawa has decided not to resign itself to being treated as an item to be 'pawned,' to the U.S. to curry favor with it. ... Isn't it fair to say that Okinawa is treated like a 'political desert island,' tantamount to being politically nonexistent, and will in no way have its will acknowledged and reflected in your administration?" 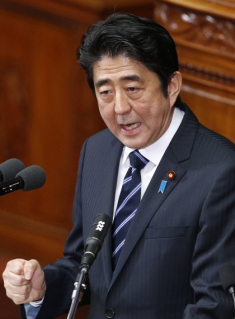 Japan Prime Minister Shinzo Abe: The most right-wing Japanese leader in years, and who is in the midst of a territorial confrontation with China, wants the U.S. on his side. But the people of Okinawa appear unwilling to be the instrument of his effort to satify Washington. Mr. Shinzo Abe, your visit to the prefecture [Okinawa] is the first since your return to the office of the prime minister, and people here are watching cold-eyed and with a measure of apprehension. Before visiting the U.S. later this month, you want to apply to the governor's office for permits to reclaim land in public waters, which is required for relocating the U.S. military's Futenma Air Station to Henoko. And like a souvenir, you would like to bring signs of progress on the relocation plan for the prefecture to the president of the United States. Could this be the reason for your visit? If so, you are not welcomed here. Okinawa has decided not to resign itself to being treated as an item to be "pawned," to the United States to curry favor with it. At the National Diet yesterday, you said you will "listen carefully to the voice of Okinawa." How many times have we have heard such words from the mouths of prime ministers? And while uttering them, isn't it the case that you hope only to hear what you want to hear? : "Relocation within the prefecture is acceptable." We ask you to please "hear" us correctly. If you do, you'll acknowledge that for Okinawa there is no going back, and that the people of the prefecture have an indomitable will to reject this relocation. The executive committee of the Okinawa prefecture has submitted a kenpakusho [formal petition] calling for scrapping the deployment of the MV22 Osprey - a vertical take-off and landing aircraft - and for not only abandoning Futenma's relocation within the prefecture, but its outright closure. The kenpakusho is a clear expression of the Okinawa people’s will, and is a symbol of our historic sacrifices. The kenpakusho is signed and stamped by the prefectural assembly speaker, the heads of every municipality and chairpeople of all municipal assemblies, and the presidents of other Okinawa groups and organizations. You should recognize the weight and significance of this. Amid opposition by the Okinawa people, the deployment of the Osprey was forcibly undertaken, and countenanced by the administration of the Democratic Party in Tokyo. Do you plan to repeat this? In a poll last year, ninety percent of prefecture residents were against the Henoko relocation. Every member elected last year to the four single-seat constituencies in the prefecture is opposed to it. But in spite of this, shortly after the election, you said you wanted to, "work toward relocating the base to Henoko, Nago City." Isn't it fair to say that Okinawa is treated like a "political desert island," tantamount to being politically nonexistent, and will in no way have its will acknowledged and reflected in your administration? Did you know that the Marine air wing stationed at the Futenma Air Station was relocated in 1976 from Iwakuni city, Yamaguchi prefecture - your hometown? And that this wasn't even conducted under U.S. military fiat? Last year, the U.S. sounded out Tokyo about a partial relocation of the Marine Corps. 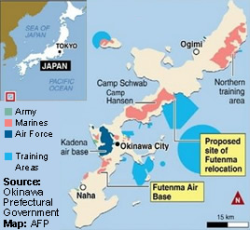 base from Okinawa to Iwakuni, but Japan's government rejected this immediately. Why is it possible to so readily conduct relocations from the mainland to Okinawa, while the reverse is immediately refused? Isn't this an obvious case of discrimination? If you want to claim this isn't discrimination, prove it. Unless you execute the reverse [moving U.S. military facilities from Okinawa to Japan's mainland], you cannot. In government, media, and bureaucracy across the country, people talk about of Okinawa's resistance as a bid to win measures to promoting its economy. Isao Iijima, a special advisor to the cabinet and member of your staff, had very close ties to Takemasa Moriya, who was parliamentary private secretary to former Prime Minister Koizumi and a vice minister of defense, who drafted the current plan for the Henoko relocatation. Mr. Moriya repeatedly states in his books that Okinawa has an agenda, and that the aim to its resistance is to gain funding. If you are paying attention, you should also know that such a conclusion is unjustifiable and wrong. There are no examples in which the government has another prefecture to allow the relocation of a an American base in return for the construction of a bullet train route. If such a thing is good enough for Okinawa but not others, isn't it nothing but discrimination? In recent years, it seems it have become almost acceptable to say publicly, "politically steamrolling Okinawa is the only way to go." Doesn’t democracy apply to Okinawa? 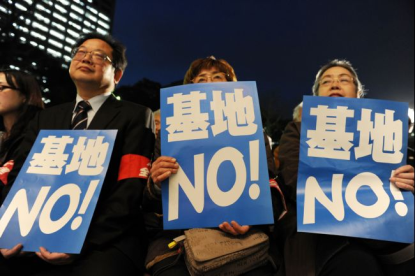 Should the will of the people of Okinawa be trampled on? Is this the nature of the Japan you say should be "restored"? You said in your policy speech at the opening of the Diet that you will "restore the bonds between Japan and the United States." These are "bonds" maintained at the expense of Okinawa and are nothing but a house of cards. If you really want to show the value of Japan-U.S. relations, you should break Okinawa's chain of sacrifice. The issue of bases must be dealt with appropriately, and you should pursue a new and more sustainable form of Japan-U.S. ties.